Velvet, metal legs, polished brass feet. Ignazio Gardella was an Italian architect, engineer and designer. Born in Milan in 1905, Gardella belonged to a family from Genoa, where the profession of architect had been handed down over four generations. In 1931, after graduating in Civil Engineering from the Milan Politecnico, he started his professional career in Milan, playing an active role in the cultural life of the city, while also observing the development of architectural tendencies in other European countries. The same year, Gardella travelled to Germany on his first study trip, meeting the architects of the Frankfurt School. 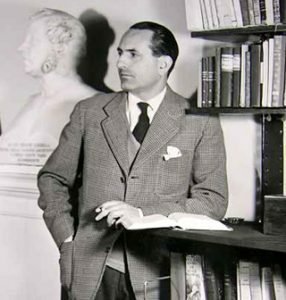 During this period, he was in constant touch with Giuseppe Pagano – architect and director of the influential architectural journal Casabella – with whom in 1939 he visited Finland, Sweden and Norway, meeting Sven Markelius and Alvar Aalto, and participating in numerous debates and symposia on modern architecture. appropriating both classical and vernacular traditions. Later in life, Gardella would be the first to break with Italian Rationalism, reviving instead the neoclassical style of architecture. The project that officially marked Gardella’s debut and epitomised the beginning of an unexpected current in the rather short history of modern Italian architecture was the 1938 Tuberculosis Clinic at Alessandria. Among the many prizes and recognitions that Gardella received during his career are the first Olivetti national prize for architecture (1955), the Fiuggi prize for architecture (1988), and the prize for culture of the Italian Government (1991). Fig. 2. 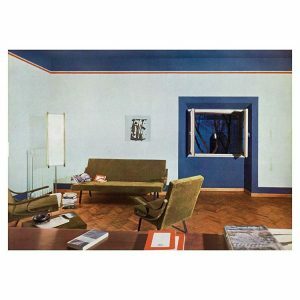 A Milanese interior featuring a special-order Digamma settee, 1957. Gardella, Argan. 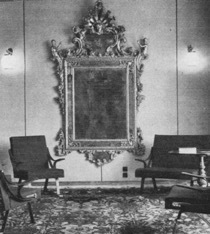 In 1947, along with Corrado Corradi Dell’Acqua and Luigi Caccia Dominioni, Gardella founded the firm Azucena, producing high-quality furniture and furnishings. By the late 1940s, furnishing became, in Italy, an important symbol of regeneration. While this was helped by the strength of the furniture industry, it was only made possible by the involvement of young designers, such as Gardella, who had trained as architects. Indeed, Gardella and the other architect-designers working in this field regarded the components of the interior as an essential constituent of the contemporary architectural project. By the end of the 1940s, a significant Italian modern furniture movement had emerged and been widely disseminated. 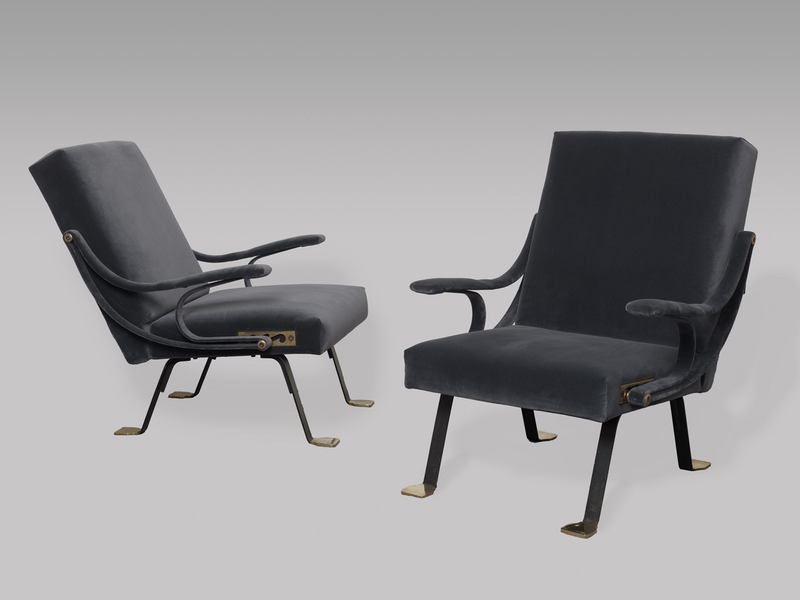 Produced by Gavina, with whom Gardella collaborated throughout his career, the Digamma armchair is the result of this novel modern furniture movement. With two attached foam rubber cushions set in a metal frame, the Digamma armchair has a tilting chair back. The hinged arms, made of sheet steel and covered with cloth, allow three different positions for the chair back. Fig. 3. The Einaudi bookstore located on Rome’s Via Veneto, designed by Luigi Parisi and Ignazio Gardella, early 1960s. Giulio Carlo Argan, Ignazio Gardella (Milano: Edizioni di Comunità, 1959). Ignazio Gardella, exhibition catalogue (London: RIBA Heinz Gallery, 1994). Penny Sparke, “A Home for Everybody: Design, Ideology and the Culture of the Home in Italy 1945-1972” in Modernism in Design by Paul Greenhalgh, ed. (London: Reaktion, 1990), pp. 185-202. Mel Byars, The Design Encyclopedia. London: L; King; NY: MOMA, 2004.